Another method for preparing pig’s head is to first break open a wooden bucket and install a copper sieve in its center. Wash the pig’s head clean, place it in the prepared bucket with the required seasonings, and gently steam everything elevated from the cooking liquid. When the pig’s head is cooked and tender, any greasy and foul drippings would have flowed out of the sieved bucket, making the dish exceptionally good. : Washing a pig’s head is pretty messy business, even more so than the trotters. You have burn off the bristles, then scrub-out all the mucus, dirt and filthy gunk located inside and around every nook and cranny of the ears, mouth, gums, eyes, and snout before you can consider it somewhat clean. Some people simplify the second for of this task by scrubbing using Coca Cola instead of water, which does an impressive job of cleaning due to the phosphoric acid in the drink. My mom used this technique to wash tripe, resulting in the most squeaky, mucus free tripe one can get without using industrial cleaners. Just imagine what a can of coke does to your stomach… The pig’s heads noted here are pretty heavy, so I doubt they have not been deboned. : In the Sturgeon section I decided to translate 滾 (gun) as a “moment” and so I will do the same here. In that section I’ve also tried to figure out what is a 滾 (in seconds) and came to a rather flaky conclusion that it’s anything from a few hundred milliseconds to a bit more that two second. I think the only way to figure what how long a period of time Yuan Mei’s “滾” actually amounts to, is to measure the cooking times of the foods being mentioned. This is something that I did in a cursory manner in the sturgeon section, but here we have another chance to recalculate to confirm the accuracy of the conversion. 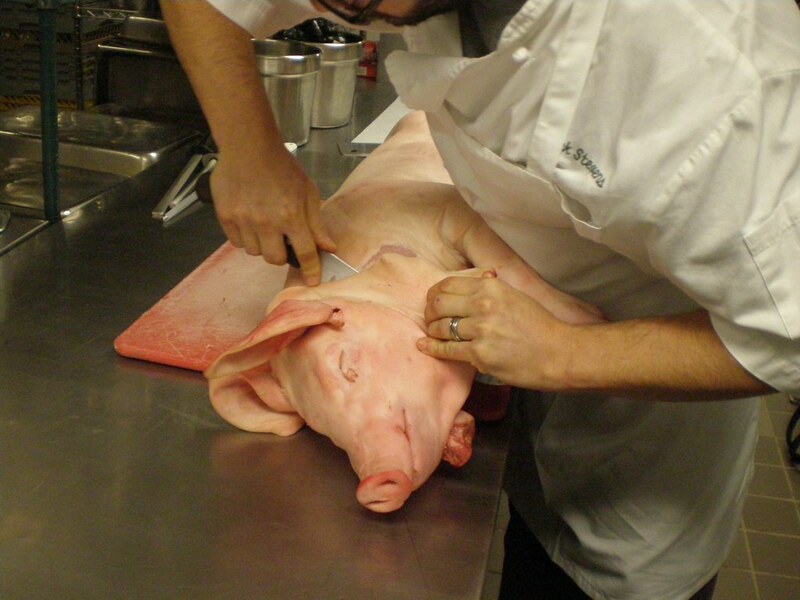 We know that the purpose of the technique lasting for 200滾 is to to par-cook the pigs head to seal-in most of the blood. This technique is done for making Dongpo pork as well, where the thick chunk of pork belly is boiled whole for several minutes. If we go by the ~2 seconds/滾 conversion from the sturgeon section, 200滾 would amount to 6-7 minutes, which is a bit short for par-cooking a large pig’s head (brain removed). In my experience with cooking pigs head, it typically takes around a good 10-12 minutes of boiling for the bones and meat in the head to stop oozing copious amounts of blood. This would mean that 200滾 is more likely around 600-720 seconds or rather 3-3.6 seconds/滾. This tells us our prior assumption that each 滾 is several hundred milliseconds is wrong, and that 3 seconds/滾 may be more correct. For a while I thought it was just me who had this question but truth is, it seems that nobody out there has any idea what this unique unit of time converts into. In this French translation posting someone asked a Chinese professor how long is 200滾, who replied in a half-knowing fashion that it means “200 bubbles from boiling”. Yes…very helpful indeed. It is in reading threads like this that affirms my belief that translating the Suiyuan Shidan is not just a task that can be done by someone with an academic background who knows Classical Chinese. You also need to be able to cook Chinese food well, can understand the animal species used as ingredients and their ecology, and have a firm grasp of the social context of each dish. : Yuan Mei teaches a rather advanced concept in this elegant six word phrase, namely that the degree of reduction of a sauce must be limited by its oiliness. A properly reduced cooking liquid can effectively suspend or even emulsify the oil to create a rich sauce, but overdo the reduction and the oil will break-out of the sauce, making it unpleasent and greasy. Just break a Hollandaise sauce and see if anyone will eat it. This points directly at one of the more basic Chinese culinary requirements of cooking meat, namely that it should be “油而不腻”, or loosely translated: “oily without being greasy”. : An noted in the chapter Things to Avoid 11: Rendering Fat, when you render out the fat in meat you also render out and remove its flavour. : I’m guessing here that one breaks out the bottom of a wooden bucket and wedges in porforated copper sieve to replace the structural support provided by the bucket’s bottom.